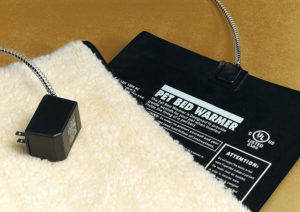 Pick up the API Pet Bed Warmer at Noah’s Pet & Wild Bird. These pet bed warmers provide gentle heat and can be used with any pet bed that measures at least 12 in. x 15 in. A transformer plugs into any standard outlet and supplies a safe 24 volts to the heating element. Just because they’re covered in fur doesn’t mean they can’t get chilled in your drafty house. Make your pet’s bed comfy and warm with an Allied Precision Pet Bed Warmer. Pick up your API Pet Bed Warmer at Noah’s Pet & Wild Bird in Fayetteville or Bentonville, Arkansas. Come to see us for all your pet food, supplies, and supplements. We can’t wait to serve you. This entry was posted on Monday, October 8th, 2018 at 9:00 pm	and is filed under News & Updates. You can follow any responses to this entry through the RSS 2.0 feed. Both comments and pings are currently closed.